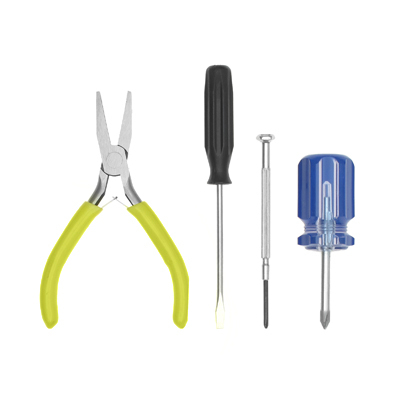 Cartridge Tool Kit for the RX-047 Toner Refill Kit -- Includes Flat blade screwdriver, Pliers, Magnetic tip Phillips head screwdriver, and #0 point jewelers Phillips head screwdriver. 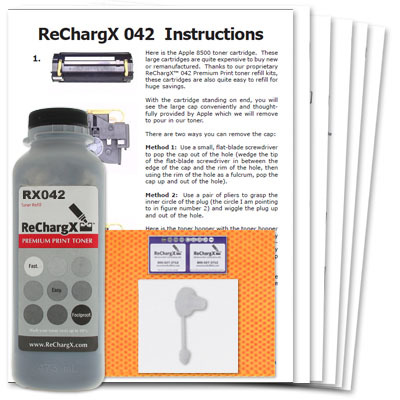 Do-It-Yourself Toner Cartridge Refill Kit for the following printer model toner cartridges; Apple Computer 8500/ Laserwriter 8500, General Computer Te ELITE XL 20-/600/ Te ELITE XL 20-800/ Te ELITE XL 20-1200, IBM InfoPrint 20/ InfoPrint 4320; Xante ACCEL A Writer 3/ ACCEL A Writer 3 G/ ACCEL A Writer 3 N/ ACCEL A Writer 3 DN/ Platemaker 3/ Screenwriter 3; Xerox P 880 printer cartridges. Includes Easy-To-Follow instructions, toner bottle (same gr. of toner as the original OEM high yield cartridge), can be used on Starter, Standard Yield, or High Yield Toner cartridges You will need the following tools (NOT INCLUDED) to use this kit --Flat blade screwdriver, Pliers, Magnetic tip Phillips head screwdriver, and #0 point jewelers Phillips head screwdriver!! !